Hey, could you elaborate more about xml != json ? What's missing? xml ids (like for crossing branches in TBs) ? As mentioned, we actually started with json. The first version of the SWC was actually annotated using json and I converted that to XML. To obtain the second sentence, you needed to get sentence_starts and sentence_starts, then obtain the sub-list of words defined by those bounds. You can notice the downside of data normalization. You can see that it is much more succinct. To obtain the second sentence, just do an xpath query: sentence (more about using xpath at the bottom of this post). The distinction between data and annotation is not clear in json: in XML, everything that is not an XML tag is character data. To get the original text, just strip all XML tags. In json you would somehow have to externally define what the original data is and what the annotation is. This is important because we keep character-by-character correspondence to the original data. This is a very cool feature because you can cross-reference our annotations with the html markup to e.g. look at the impact of <b> tags on pronunciation. I had a look at json-schema and will give you a short comparison. In our annotation, a section has a title and content. The title is a list of tokens, some of which might be ignored. The content of a section can contain sentences, paragraphs, subsections or ignored elements. I think it is fairly easy to read if you are acquainted with standard EBNF notation – | is an or, * denotes repetition and so on. Say you want to work with an XML annotated corpus. The easiest way to do that is XPath. You are only interested in long sections? Let's get the sections with more than 1k tokens! Note the .//, the leading dot means “start descending from the current node”, with just an //, you would count from the root node and not from each section. You want to know the difference between start times for phoneme-based and word-based alignments? Here you are! And that’s it! In my opinion, it’s easier than working with deeply nested json data structures. Questions, comments? send me a mail. We recently went for a ride at the very nice Alsterquellgebiet just north of Hamburg. We had a camera mounted and from time to time, I shot a short video. 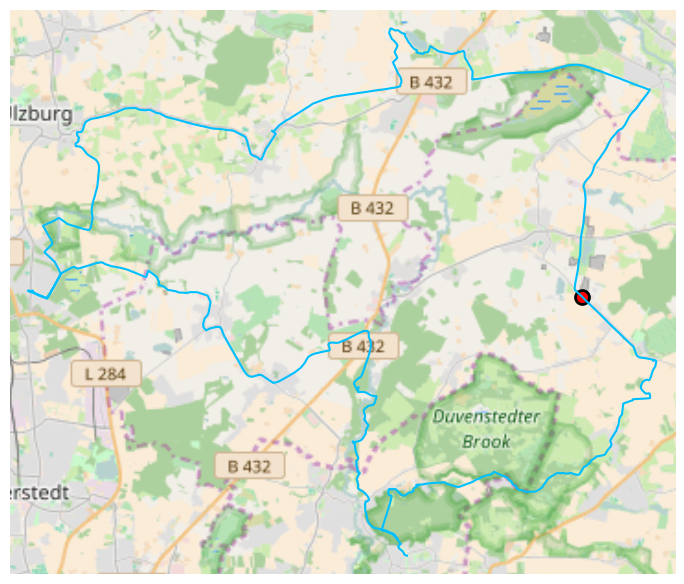 Given a gpx file and a set of other files, it downloads an OSM map for the region, draws the track, and for every file determines where it was shot (based on the time stamp as my files sadly have no usable meta-data). It then produces an image as above for each file. Make sure to properly attribute OpenStreetMap if you distribute these images! Since they are downloaded directly from osm.org, they are licensed under a Creative Commons Attribution-ShareAlike 2.0 license.